Cable Services distribute medium voltage cable joints from the market leading manufactures: Tyco and 3M and have over the years acquired a wide expertise in the installation of the whole range of medium voltage resin, heat shrink and cold applied cable joints. 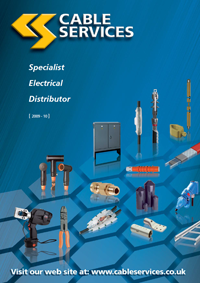 Our vast experience coupled with stocks unequalled anywhere in the UK makes Cable Services the only choice for Medium Voltage Cable Jointing products. We are distridutors and stockists of a wide range of resin, cold applied and heat shrink joints which are listed on our main website. This micro site is a resource for specific manufacturers information on the range of mv cable joints we supply and provides in depth information and specifications. Universal straight and transition joints for 3 core and polymeric cable. The EPKJ range of heat shrink non-resin joints allows for many combinations of paper and polymeric transition and trifucating joints at 11kV and 33kV. The most frequently requested are described below. Contact our sales office if the joint required isn’t listed. One piece cold shrink joint body. Suitable for paper and polymeric cables. Also 6.6 / 11 / 24 and 33kV using the 3M QS2000 and QS111 Cold Shrink Joint Bodies.